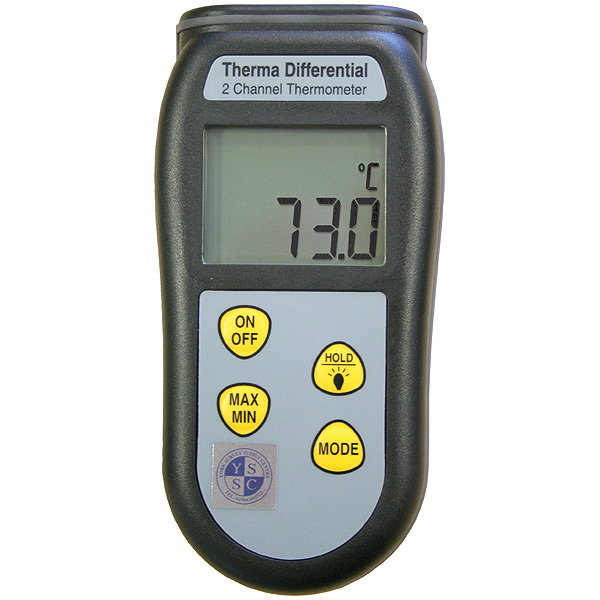 Display can be switched to show probe T1 or T2 temperature or the difference between probes T1 and T2 (T1-T2). This allows, for example, the temperature drop across radiators or the temperature rise or fall of two items to be measured. 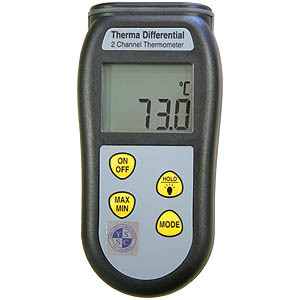 Measures temperature over the range of -99.9 to 299.9°C with a 0.1°C resolution or 300 to 1372°C with a 1°C resolution. Features a custom, LCD display with °C, T1, T2, diff, hold, open circuit, low battery indication and an optional backlight. Incorporates an auto-power off facility that automatically turns the instrument off after approximately ten minutes, maximising battery life. Housed in a durable, ABS case that has an integrated rubber seal to ensure complete water tightness and help reduce the possibility of damage in harsh environments.